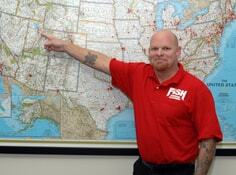 Welcome to Fish Window Cleaning Provo, UT! We are your local residential and commercial window cleaning company serving Provo, Orem, American Fork, Pleasant Grove, Lindon, Springville, and Spanish Fork, UT. We also offer reliable, year-round scheduling, emergency cleanings, and various billing options for your convenience! The appearance of your home is very important to you and it's important to us too! That's why we work hard to make your windows, skylights, chandeliers, and more sparkle. We even take care of your home while we're working by wearing fresh, clean shoe covers and using absorbent cloth pads as we clean to protect your floors. We'll even make sure you're satisfied with all of our work before we leave. You'll love the way your clean windows brighten your home! Making a great impression on your customers is so important. Let our bonded and insured team at Fish Window Cleaning help by maintaining your storefront, showroom, or office. We'll make sure your windows, glass doors, mirrors, and more are streak- and spot-free. We offer customizable service programs tailored to meet your needs, budget, and schedule. Our cleanings can range from weekly to annually and our team will be happy to suggest a program that would work well for your business. As always, we're committed to making sure you're satisfied!